Some cars achieve such a degree of popularity they become cultural phenomena, and as more and more drivers discover its intuitive handling, sleek performance, and all-around drivability, the Mazda 3 is rapidly establishing itself as a modern classic in this vein. As the staff at your local Mazda car dealership can probably tell you, the Mazda 3 has long been a popular choice for a whole range of different customers. With its responsive steering, comfortable interior, and affordable pricing, the Mazda 3 is a reliable, driveable vehicle that doesn’t sacrifice performance for style. No wonder it is one of the best selling cars in Canada. Combining the best features from earlier versions, the 2018 Mazda 3 upholds the brand’s reputation by providing a smooth ride, excellent maneuverability, and one of the best infotainment systems in the business. Fans of the Mazda 3 often note how fun it is to drive, and the 2018 is no different; Edmunds.com praised the 2018 model in a four out of five star review for blending a sporty, exhilarating driving experience with practical considerations like passenger space and a stylish interior. Mazda has built on the success of the Mazda 3 by offering customers a range of options when it comes to style and trim. Available as a classic sedan and as a hatchback, the Mazda 3 comes with three different types of trim: Sport, Touring, and Grand Touring. 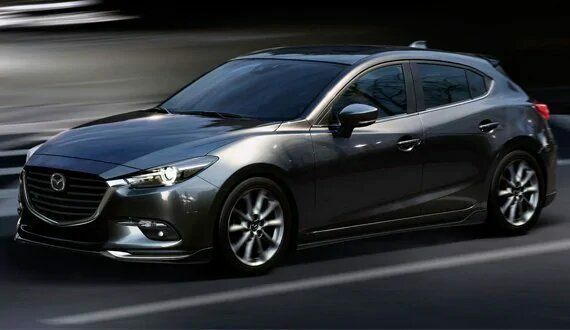 Those who want a more deluxe experience while also looking for more cargo space might opt for the Mazda 3 Hatchback Grand Touring — one of the most popular choices — while those who want to maximize passenger space might go for the Mazda 3 Sport in the sedan style. The Sport comes with Mazda’s SKYACTIV 2.0-liter four-cylinder engine, and, in a departure from previous versions, the Touring model now comes with a 184-hp SKYACTIV 2.5-liter four-cylinder engine. Both offer competitive fuel economy in the city and on the highway, received high marks from crash test agencies, and were honoured with the Insurance Institute for Highway Safety’s highest Top Safety Pick+. When it comes to keeping everyone entertained on long drives, the Mazda 3 is well equipped with an intuitive and easy-to-manage entertainment system, and also offers a 12-volt charging outlet and two USB ports. With so many features to explore, you are probably getting excited about the possibility of driving one yourself. Stop by our showroom for a test drive, and see what version of Mazda 3 works best for you. We guarantee that once you’ve experienced its excellent handling and superior comfort in person, you’ll want to drive one every day. Fortunately, our dedicated finance team will be happy to set you up with a payment plan that works for your budget. If you want to see why the Mazda 3 was named the best small car in Canada at the 2018 AJAC awards, come down to Yorkdale Dufferin Mazda and find out what makes this car one of the most popular in Canada. You won’t be disappointed!